And it's no different here in INTI. At first I didn't dare to sleep in class, that's why I spent most of my afternoons between classes sleeping. But now, I couldn’t help it! I remember I think it started on that day I slept in Chemistry for almost half an hour and got away with it. And the latest was last week during SAT Math. I just put my head on the table and when I woke up it was already an hour later! And then during our Chem test I slept for almost twenty minutes and when I woke up there's traces of my lip-gloss on my paper...still got it when I got the paper back... And last week I slept in Chem and then.....nothing la. The thing is, sometimes it's not because I'm THAT sleepy. Plus I'm considered one of the early sleepers among my friends. I just sleep because I'm bored. Seriously. When I get to my room and don’t know what to do until dinner time, I’ll sleep. While waiting for Zuhur I’ll sleep. While waiting for whatever, I’ll sleep. And now for my afternoon nap I have Elly to accompany me. Point is, I sleep just because! There's no actual reason. I can't study in the afternoon, my study time is at night and this was just a follow-up to my PMR and SPM years. I never study in the afternoon except for tuitions. If you ask ANY of my school friends they'll tell you that there's no use calling Syaza in the afternoon as they know I'll b in this altered-state of consciousness. (Big words!) Therefore, next time you find me dozing off, don’t be afraid to wake me. BUT, only if you have something better to suggest me do. However... if it's during my afternoon nap, I’ll guarantee you that even if the US of A decided to bomb INTI (since Americans r fond of bombing anything n everything...) I would still NOT wake up. That much I can promise. Wow! This is the first time after a very long time since I had a really good, and productive day. What a good feeling!! Today (Tuesday), I woke up quite early. ...Okay that's actually a lie. It's not really early la... But I woke up around 6.30 something and went straight to the bathroom to take my bath. ...Suddenly I remembered someone's comment about bathing early in the morning... Anyway. The thing is, usually I'll wake up around 6.30 to pray n then continue sleeping for about 30min till about an hour. But since I took my bath early today, I had a lot of free time. Mind you I don't spend half an hour staring at the mirror doing my make up, so that's why. So, I took that time to revise a bit on my calculus notes, and on what we were going to learn today. And then, actually I was quite nervous to go to my calculus class today because Mr. Fo will b giving out our test result back. I was nervous because when he was giving us the answer last Thursday I had a feeling that I had gotten most of the answers wrong! But since Mr. Fo is THE BEST LECTURER EVER, he gave marks at places where he can see there's effort. Seriously! Though actually, my answers are not that wrong. Just careless here n there. When Mr. Fo called my name I was really nervous, because he said nobody gets full mark, and Valerie who got 23 was the highest. Then when I came up next to him when my name was called, he looked at my paper, up at me, n then said, "Good," and smiled! I got 21/25! Okla! After class, instead of doing nothing...or sleeping, (remember, I got A LOT OF free time until 4pm!) I went to my psychology group meeting. Okla what, I mean I didn't waste my time...like usual. After that, I cannot help it. Have to teman Elly sleep. We slept until...I don't know. But then I woke up early because my group had a meeting with Dr. Fulton at 3pm. Again, instead of lazing around, I did something productive! Go Syazaaa! :p After that was Chem lab. But then, as I went through my adolescent years, through all those 'rock-chic' phase, those unstable phase in life, I realize that heck, I'm not that much mature! If I was, I would not have made the mistakes I made and I would have not hurt so many people in my life. I realized then that I was in a self-discovery journey. I made LOTS of mistakes and learn from them. (I always say this, I'm not proud of what I did, but I'm very proud of how I carried myself through EVERYTHING) Back then, I tried looking at myself from other people's perspectives to try to understand myself and consequently better myself. People often questioned me, why do I change for people? I can’t say this enough. I don't change for random people, but if the people I love and care about like my friends and family, if they say something believe it or not I'll take to heart. I won’t mind changing aspects of my life that need to b changed. Oh the journey for me was not an easy one. I fought with about everyone, disapprove of many ideas and cried countless nights. It took me almost 4 years just to get out of it. But now, I'm glad of where I am! Now, I do believe that I'm mature. But of course I'm not the most mature person in the world. I'm still learning and listening to what people have to say but why I say that I'm mature is because I'm not as...kabut, as I used to b. I'm more...cool, calm, and collected. Before, I had a very BAD TEMPER. Very! Oh God, if you trigger the wrong side of me you're totally going to get a taste of it. Now I no longer get mad like that :) And back then if things don’t go my way I would cry. And then pout. And then basically have a bad mood all day long and hurt those close to me. Thankfully, I no longer do that. Nowadays, I just put a smile on my face and try to accept other people's...differences. If I do not agree with someone, I TRY not to raise my voice or it’ll get ugly... There's actually a lot of reasons why I think I'm mature and why I think I convey that side of me best. Maybe because I'm very opinionated about life. But you know what, I think sometimes that's the immature part of me. Sometimes I appear to be too strongly-opinionated and can't accept other people's idea. The thing is, I'm a debater myself n I believe in that EVERYBODY has his or her own sets of opinion. We can exchange ideas, but I would NEVER try to 'convert' people to my ways of thinking. Anyway, most people think that mature equals to being open-minded. For me that's not the case. I'm open minded in that I can accept other people's view, but for me, you can’t be too open minded that it hurts others. That's plain selfish. Why I decided to talk about this was because last night, Sofiya, Lilian and me, (Wenli was too quiet!) were talking about stuffs...important stuffs that lie close to my heart. Oh I love having those conversations. I used to have it all the time with my babe, Shila. We used to ponder a lot about life... And we both do a lot of readings, and I know she's very much mature too. She can totally stand on her own too. Well, what should I report on that night... I guess I'll do a short entry as I'm really tired right now. Sofiya and I were ready by 6.30 pm because I thought I want to take my cell from the shop but as it happened to b, my cell will only b ready on Sunday. So Sofiya practiced her driving skills around campus first as we waited for Elly and Diana. Then they came down around 7, but we can’t go anywhere as we have to wait for Shahrin. He FINALLY arrived around 7.30... So then we made our way there. Once there, Elly, Diana, and Sofiya all got friends... I'm the only one with no friends to greet... We sat together, Elly, Diana, Sofiya, Me, Haniff, Iman, and Imran. The show was ok I guess. I know I'm having fun making small remarks with Diana here and there :p The food was...okla for RM40. I guess everyone was really looking forward to OAG's performance. Once they came out we were laughing as Radhi was 'recycling' the script he used during the 8TV Youthtour. That was the closing and once OAG said bye, we started planning our way back to INTI. While going out from KDU, we found the band smoking outside the building near my car. Yeah, right. That was it. Yeah! And I met Aina from the Majlis Anugerah Cemerlang Selangor bla3... Syar, you remember her right? She's the one doing accounting too. She's in KDU doing her A-Levels now. Anyway later that night was a bit...urm... Anyway, talk later! Last night Diana was fasting and she decided she wanted to MAKAN BESAR! So, we went to Alamanda, for the third time. We ate at this place Sofiya suggested, The Coast. It was kind of nice...really. How can it not be, I ordered steak, and. it. was. marvelous. (Because there's no such good-tasting steak anywhere near INTI! :p) But of course it cost me a lot! But once in a while.... And then last night I found out a little something2 that really got me down... Only my girls know what it is... Never mind. Not worth mentioning. So then today I woke up really down. 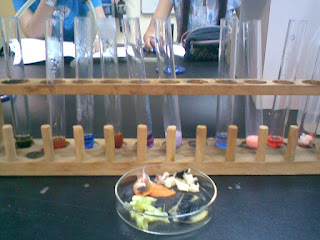 I went to Chem class in my sour mood... Go through it with a smile though... And somehow I was able to lie to my heart. But then, we found out that the SAT mock-test result was out. So what else, Elly, Diana n me went to Mr. Chan's office and saw the list. Of course. My name was not included in those going to take the real test this year. I would be lying if I say I wasn’t disappointed. But then, I kind of know it's going to b HARD for me to get it. It's HARD. And it's NEW to me. But oh well, I do believe that everything happens for a reason. I'm not saying staying in INTI is better, because that would totally b denying because I know I want it, but what else can I say? And INTI isn't that bad... If there's going to be more events such as that I'm going to talk about, I'm down with staying here. PLUS! I got full mark for my math section! Know I'm good at something! But of course after that Elly and I weren't in the mood for ENL (Anyway Elly got to take the test this year, finally! Congrats girl! :)). But what can we do, not like we can just walk out like that. We were so in a bad mood that we considered skipping psychology (As if Dr. Fulton's going to teach.) But then decided to go, after listening to Rassyid and Naim's concern words... Aww... Thanks guys! Ok2, we won’t ponteng unless it's really 'important' guys. After class....PARTAYYYY!!!! The 8TV Youth Tour finally made its final leg of the tour which was at INTI. Elly, Wenli, Lilian and I were in front of the stage from 5 something up till 8.30! Right up front! Woohoo! My favorite act believe it or not is this band that came out early called...um, I'm not sure. We didn't catch the name! :( But they were good and the vocalist is 'ahem'2... Right Elly smelly? Oops, wrong question, Elly is in love with Radhi now. Plus it's cool when Rina Omar said "It's nice coming to private colleges!" or something like that. Then later tonight Elly, Sofiya and me studied psychology as tomorrow's going to b the stupid test on the nine chapters we haven’t even finish learning yet, and instead of being MCQ as he promised, Dr. Fulton made it a fill in the blanks question! People pray for me! Now I better sleep, sian sofiya... nite2! I LOVE MY CAR NOW!!!! There ain't going to be any more problem with my battery to start the car! Or maybe because of that thing. Read previous entry. Or maybe cause I have tests coming? I don’t think so... Chem, I have studied and like Elly said, it's just a repetition of form 5. Calc, Mr. Fo just said it's going to be next week and it's only on 1 and a 1/2 chapters. Psychology...let's just say I'm going to use my favorite strategy...TAWAKAL! ENL? There's going to b a test next week, and I’ll only know what it’ll be of, tomorrow. p/p/p/s: I promise this is the last! ...CHECK OUT MY NEW BF, BEN DEIGNAN!!! added later: Sofiya made me laugh like HELL! Thanks babe!